Just how big a deal is this demonetisation of Rs. 500 and 1000 notes? TL;DR: it is a big deal, there is perhaps 6 trillion rupees of black money out there. 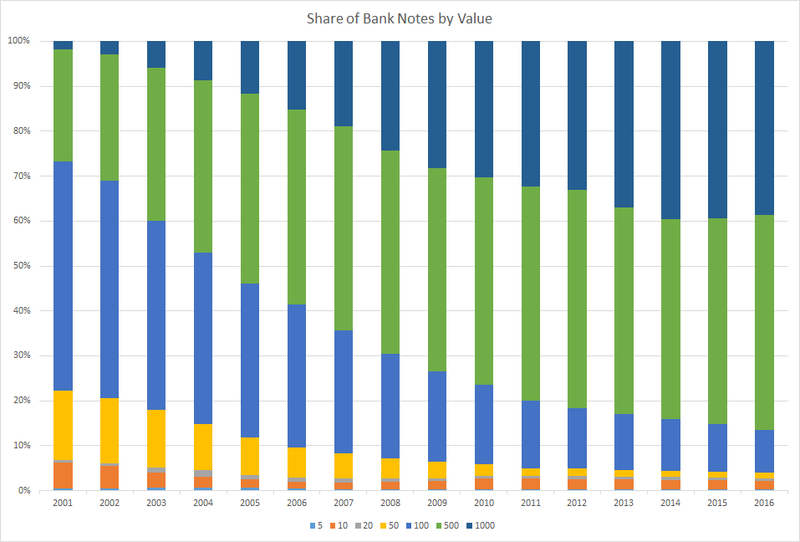 The first two charts show the distribution of notes by various denominations over the past 16 years. 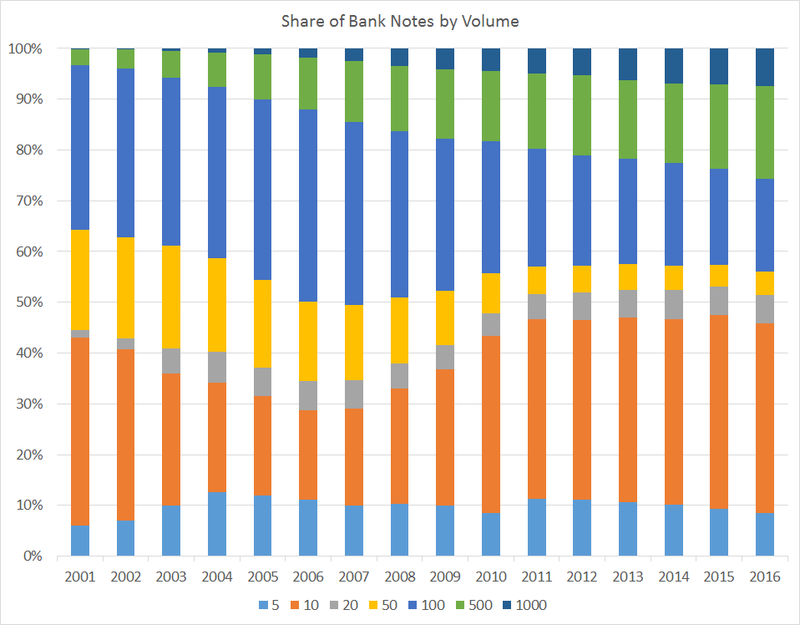 The high value notes now form a little over a quarter of all notes in circulation (26% compared to 3% back in 2001). The story with respect to value is starker. These notes are now about 86% of value of all notes (up from 27% at the start of the century). Given that in India about 90% of all transactions are cash based, withdrawing these notes will have a material impact on economic activity in the near term. The question is whether the RBI can replace enough notes so that businesses are not frozen for longer than a few days. Right now, anecdotally, people are getting by by extending credit and expecting repayment once things settle down. Major parts of the economy including agriculture, wholesale and retail trade, etc. operate almost entirely on cash and if it takes more than a couple of weeks to replace cash, we could look at a material medium-term slowdown in the economy. 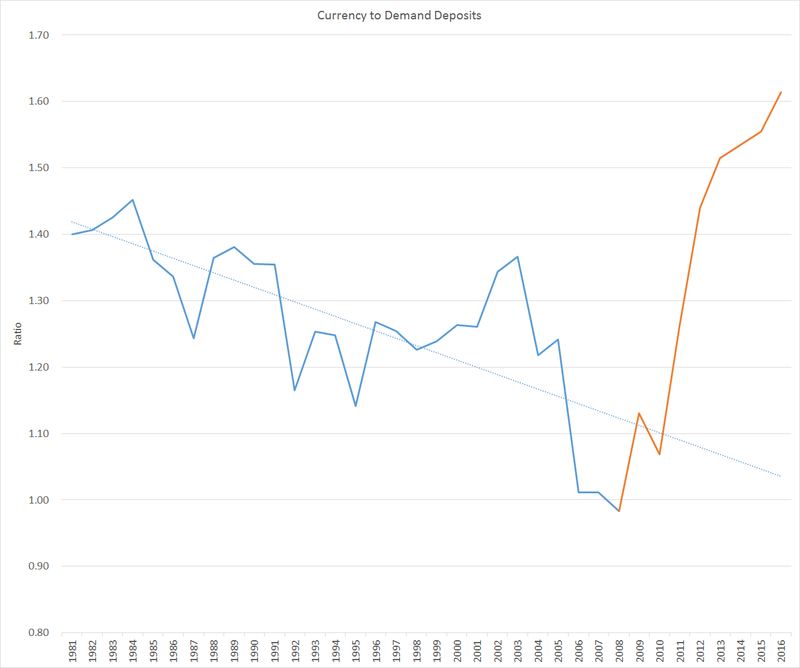 My last chart looks at the growth in total currency in circulation relative to demand deposits. Why demand deposits? Basically to look at the economic/business activity perspective. Demand deposits (in RBI terms this only includes current accounts) are basically transaction accounts. As they pay no interest no one keeps more money in current accounts more than the minimum necessary for business transactions. Cash serves a similar purpose. Looking at the ratio of cash to demand deposits, one can immediately spot a trend over time. 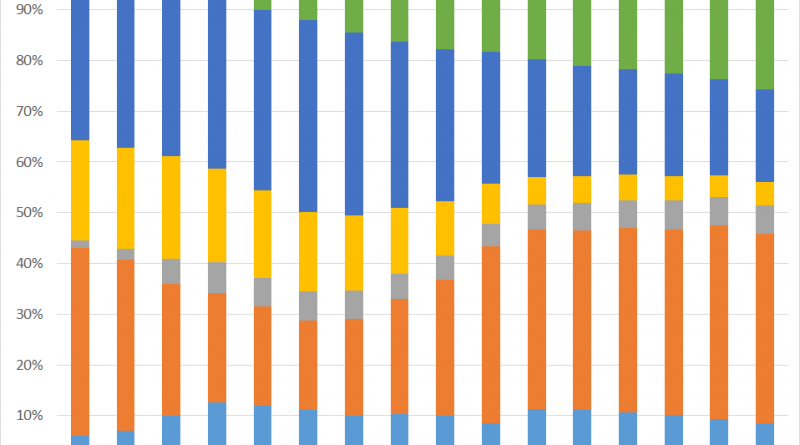 This chart goes all the way back to 1981 (arbitrarily chosen). 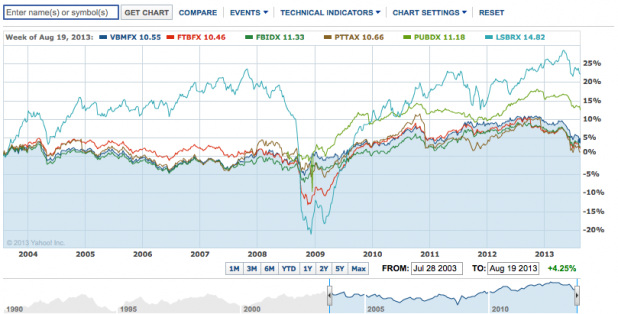 If you look at the period from 1981 to 2008, there is a broad downtrend in the ratio. 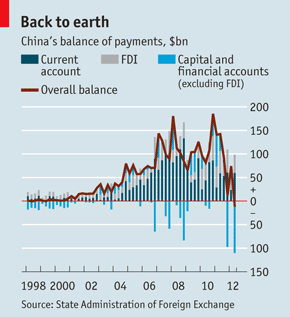 This is explained by increased access to banking / formal channels of money transfer. Better payment systems such as the Real Time Gross Settlement system (RTGS) and National Electronic Fund Transfer system (NEFT) have all enabled easier transfer of funds and reduced the need to hold cash. 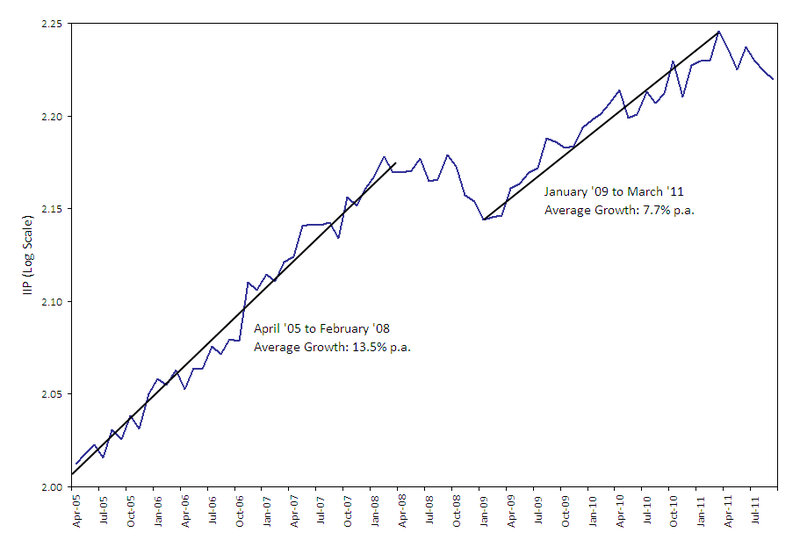 The blue dotted line is the linear trend line for this period. Post 2008 we see a large jump up in the currency to deposit ratio. In fact today the ratio is the highest than it has been since 1970. Whatever one may say banking has come a long way in the last forty five years and there is no need to hold so much cash. This is where the argument of black money comes in. If this cash is not used for transactions, it must be just a store of value. And since currency is held despite high interest rates, it must be held because it cannot be laundered into formal channels. The long term trend suggests that there should be about the same amount of currency in circulation as there is demand deposits. Demand deposits aggregate to Rs. 9.9 trillion. Thus currency in excess of about 10 trillion should be “unaccounted.” Today the total currency value is Rs. 15.9 trillion. This suggests that about 6 trillion is black money. It is of course possible that this is an overestimate. But at a reasonable assumption, somewhere between 2 and 6 trillion rupees is likely to be black money. This is what the government hopes to capture. A note to readers: this is the value of RBI notes in circulation. The Prime Minister said that there are large quantities of fake notes in the system. Naturally these notes do not form part of RBI liabilities, but they do have macro economic consequences. Sources for data for these charts is RBI.